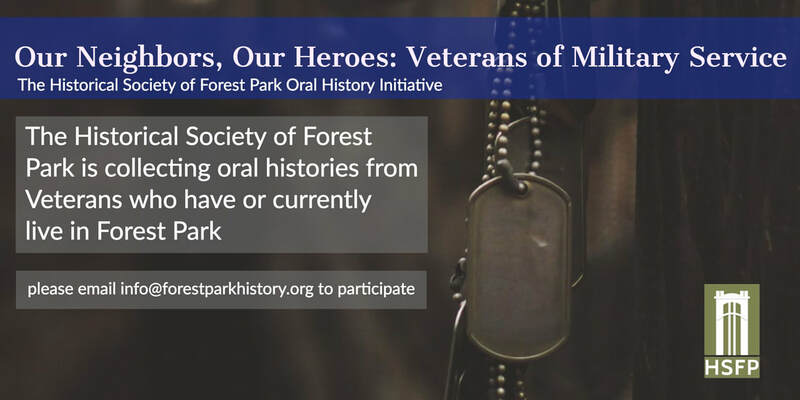 The Historical Society of Forest Park is proud to announce our new oral history project; Our Neighbors. The first chapter of this project, Our Neighbors, Our Neighbors will focus on Veterans who have lived in Forest Park. Our exhibit on Cemetery Symbolism is open to the public in the Lower Level of Village Hall. Stop by any time Village Hall in open. We are creating two new community quilts similar to the 1923 Chamber of Commerce quilt in our collection. One quilt to honor our Forest Park Families, the other to celebrate Forest Park businesses. Family squares are $25, business are $40. Be a part of history! ​Search our website for exciting events and programs You can also become a member of the Society and/or volunteer.